HomeEducationRenewable energySolar energyAnimated Info-Graphic Explains How Solar Panels Work? Animated Info-Graphic Explains How Solar Panels Work? Solar power is talked about a lot these days. Whether it’s a new solar panel installation on your neighbor’s roof or one of the growing numbers of solar panel “farms” located near many highways, this technology is showing up more and more in our daily lives. This is an exciting time for solar power. 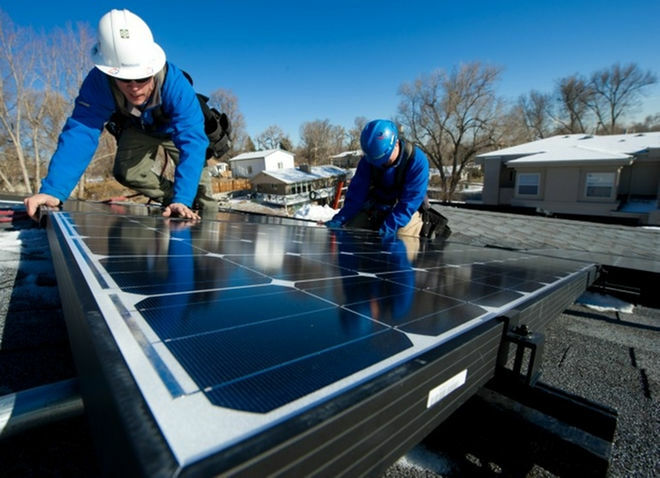 According to industry reports, solar power made up about 40% of all new electric capacity installed in 2014. In addition, the nation’s solar capacity by the end of 2016 is projected to be double what it was at the beginning of 2015, while costs continue to decline and panel efficiencies increase. The question many people have is: How exactly do those panels work? Unlike power from a wind turbine or even a power plant, solar panels don’t seem to have any moving parts -- so how exactly is that energy being produced? The simple answer is that solar panels are made up of silicon and conductive metals, which form an electric field. When sunlight hits, the solar energy shakes electrons in the silicon out of their “natural” state, while a circuit attached to the panel is able to generate a current out of those electrons’ desire to return to their original positions within the panel. If this seems a little too complicated, don’t worry! With solar power becoming more important and widespread, it is helpful to know how those dark glassy panels create all that energy.